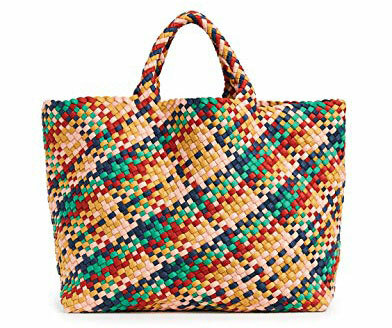 The Naghedi St. Barth’s tote is an incredibly vibrant, colorful, and durable choice for those wanting a casual large tote. It’s excellent for everyday use, and would make an especially great tote for a tropical vacation or cruise. This colorful Naghedi St. Barths Tote is sustainably sourced and accessible as a more casual piece. The color called Calypso is a vibrant weave of blue, green, red, yellow and tan give it a fun, vacation look. The Naghedi St. Barths Tote is casual, and multi-functional. Shoulder straps crafted from the same basket-weave neoprene are comfortable and soft in your hand or slung onto your shoulder. Because the bag is made from neoprene, a synthetic rubber this tote will maintain flexibility over a wide temperature range. The material also makes it easy to clean. So it’s excellent for travel by sand, or by sea, or really wherever you need. The interior of the Naghedi St. Barths Tote is simple and straightforward. No pockets, no zippers. Much like a beach bag. It’s an empty shell. Although the interior is unlined the bottom has a base to give the tote structure and shape. Even though there are no zippers or compartments the tote does come with a small zippered pouch. The pouch is the same colors weave. It’s a nice little bonus, that will allow you to store your phone, wallet, and other small items. It’s very spacious. One could easily load in all the daily needs. 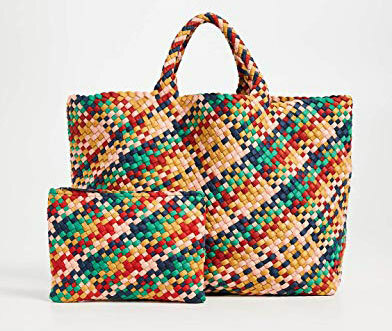 It’s especially an excellent bag for a beach vacation or cruise. You have plenty of space for your beach towel, sunscreen, change of clothes and so on. 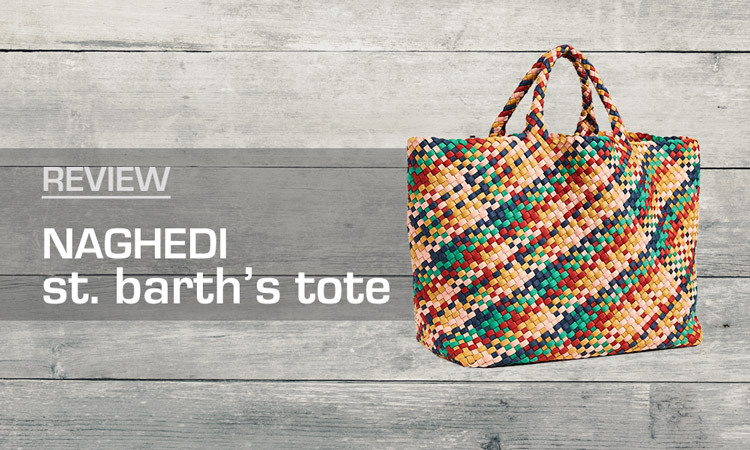 Because the Naghedi St. Narths tote is made from neoprene, a synthetic rubber it is easy to clean and wipe down. The nature of the construction material allow the tote to expand efficiently without putting stress on the structure. The shoulder straps, also made of the same rubber are sturdy and well-made. This is a quality bag, that is quite durable. In it’s many shapes in colors from Naghedi it’s known for holding up well. 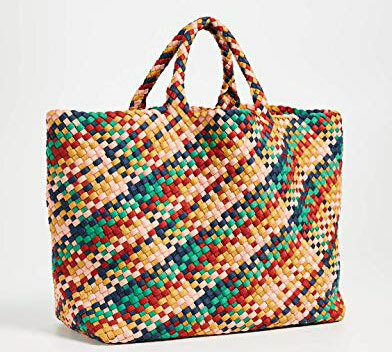 Ehhh, $240, for what seems like a beach bag? I’d proceed with caution. However,if you have to kind of lifestyle that demands such a tote for regular use, or need it for a special occasion, this is a great buy. It’s quality made and will last a long time. Because of the beautiful multi color weave it will coordinate well with many outfits. Therefore, this is a tote you can use frequently. 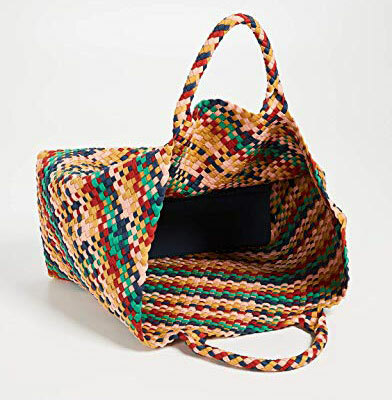 This colorful Naghedi St. Barths Tote is found on Amazon and is a durable casual bag with a vibrant weave of tropical colors. Crafted in fine-knit strands of strong neoprene, it is flexible and multi-functional. The spacious interior is an empty shell for you to easily stuff in everything you need. Accompanying the tote is a matching zippered pouch for small items. Although it’s pricey, this study bag would be a fantastic tote for a cruise or tropical vacation. It also makes a unforgettable gift for stylish ladies of any age.